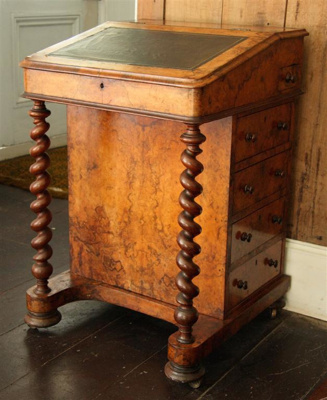 Davenport; a davenport writing desk with a walnut veneer, dating to the mid-Victorian period. The top writing slope has a central piece of black leather edged with gold leaf detail. The top is hinged, revealing four drawers, and has a lock mechanism but no key. The base consists of four drawers accessible from the right side; with four false drawer fronts at the left. The front is supported by two spiral barley-twist legs. The desk sits on brass casters. This davenport is believed to have belonged to Lady Atkinson, Harry’s second wife, and is a representative example of the high quality furniture they would have enjoyed.